The purpose of the Key Citations series is to be a source of information about the different subfields of impact assessment. Each Key Citations listing is a selection of readily-available publications that typify the particular subfield of impact assessment. Primarily, the listings are to provide a source of readily accessible information for people wanting to learn more about that subfield. However, they might also be regarded as representing the core literature of each field. The Key Citations series is under the general editorship of Dr Elsa João (University of Strathclyde, Scotland). 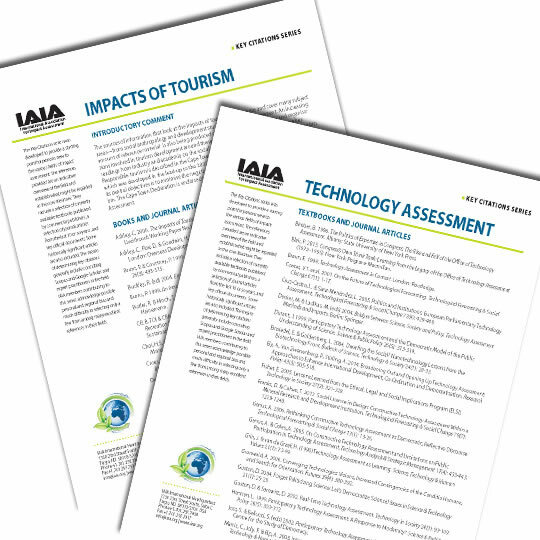 The guidelines governing the Key Citations can be requested from her or from IAIA Headquarters staff.